Awww, spaghetti and meatballs, what a comforting food! What a fun food-just watch a child eat it for the first time! How do you enjoy eating yours? Are you a twirler? A slurper? A cutter? First when storing your spaghetti and meatball leftovers, try to keep your pasta stored separate. Just rinse it and drizzle a little olive oil on it and store in a ziploc bag or sealed container, then just drop it in a pot of boiling water for half a minute when you need it (simple restaurant trick). You can also freeze them the same way, just lay flat in freezer and increase boiling time to one minute. 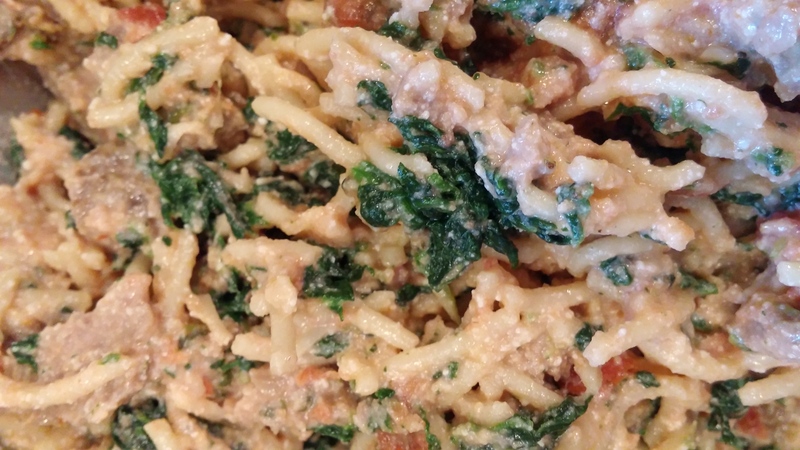 When making pasta, I usually make some extra and freeze small portions-great for a last minute side dish. 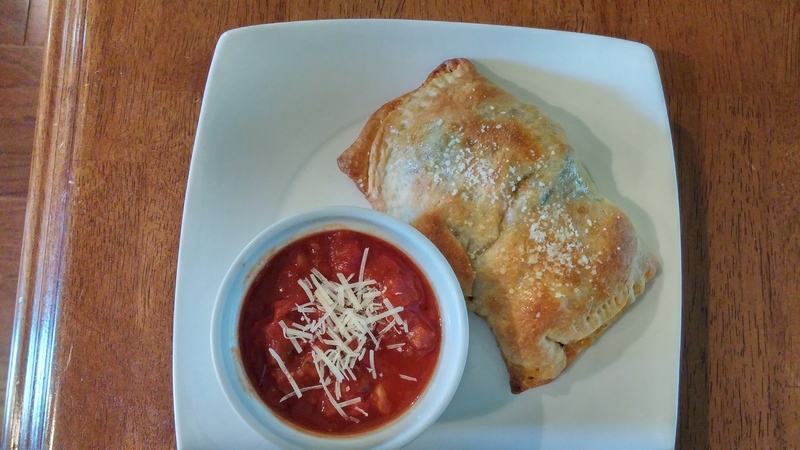 Calzones are a really simple and easy idea for just about any leftovers you may have and a good one to keep in the back of your mind. …& then there were 3! Remove the meatballs from the sauce and roughly chop along with some of the spaghetti and put them in a mixing bowl. (No need to heat either) I add in some ricotta cheese (even if you think you don’t like it, try it, it blends and flavors nicely). The amount you add is your preference and depends on how much leftovers you have left. Now is a good time to add some vegetables (may not want your kids to see you doing it!). Use what you have, I have some steamed spinach leftover, so I add it. Broccoli and asparagus are good, too. A calzone is basically a folded pizza, so think along those lines and add whatever you may like. It is your calzone! If I had some kalamata olives I would add them, but I usually eat them all before I get to that point! 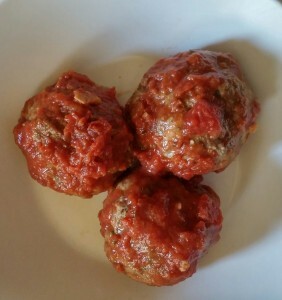 Eyeball and taste your mixture as you go (it is best to use all cooked ingredients) and I bet your meatballs are full of flavor already so careful adding too much seasoning. I love cheese so I add some shredded Italian cheese, as well. I then add some sauce, mixing in a teaspoon at a time, keeping filling hearty, not too much sauce-besides we’ll need the sauce later! 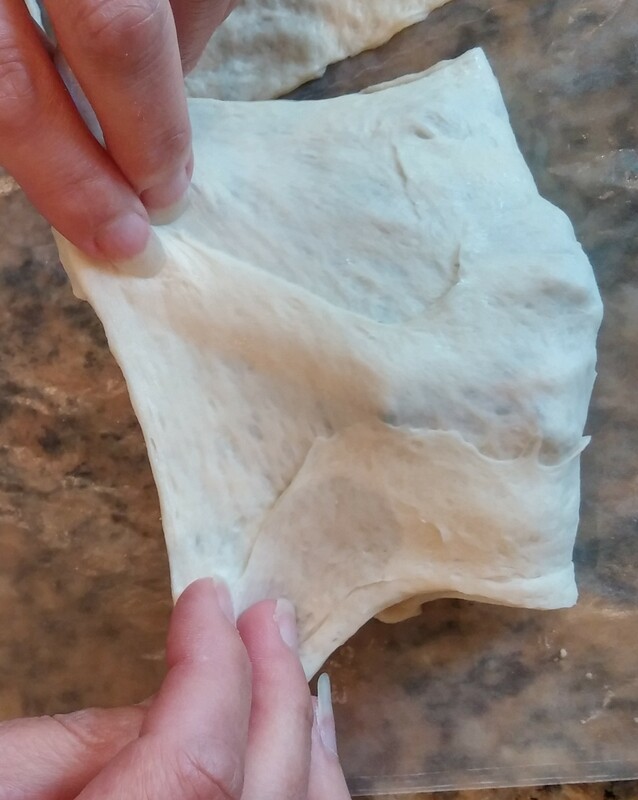 Get your favorite pizza dough ready to roll, check your local markets, most carry dough ready to go. (Or use the refrigerated roll out pizza dough, they make whole wheat now and when we’re done, nobody will ever know) If I have time I still love the whole process of making my own pizza dough. (If you have never done it, it is a fun family event!) But today, it is the “nobody will ever know if you and I don’t tell them approach”! Heat oven to 400 degrees. Add some cornmeal to a sheet pan and spread around. 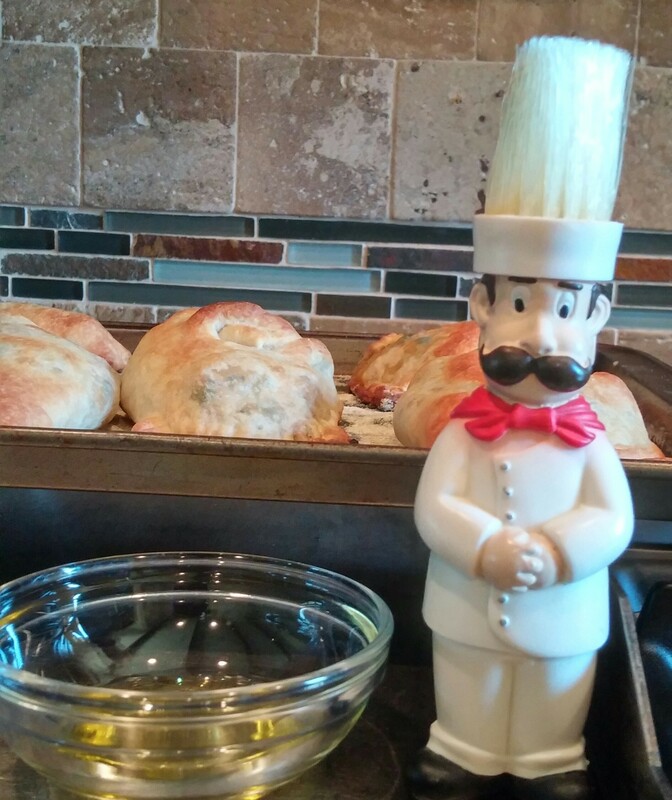 This will help keep your calzones from sticking and will also give it a nice crunch on the bottom-just like in restaurants! Put your calzones on the sheet pan. See how many you can make with only 3 meatballs-talk about stretching out leftovers! Bake until golden brown (This will depend on the size calzones you created) but keep an eye on them! They cook quickly which is why you should use cooked ingredients. I usually start with ten minutes and check through oven door each following minute. I’ve never had a batch take longer than 15 minutes! Some like to brush with olive oil (or egg) before cooking, but I like to do it at the end-gives something for my grated Parmesan cheese to stick to-see I love cheese! If you have some flavored olive oil, use it to add another flavor dimension. I happen to have my roasted pepper skins olive oil ready to go with some help from my little friend! That’s it. Calzones done. Put some spaghetti sauce in a ramekin and heat in microwave-tasty for dipping. Round out the meal with a salad and dress the table with a checkered tablecloth, listen to “That’s Amore” (or even better watch the whole Lady and the Tramp movie) and I bet you won’t hear the words spaghetti AGAIN! Put your TO COOK IS TO CREATE thinking cap on: Think about what other leftovers you may have that would work as a calzone filling? Beef stew is a hearty one for a cold winter day-just make it the same way- filling it with good stuff and serving the “gravy” on the side. 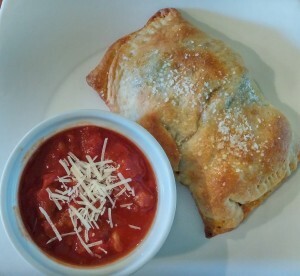 Calzones can also be sweet and savory, think about it as a turnover. So don’t just think about lunch or dinner-what about breakfast or dessert? Think about the different sauces and toppings, too. What else would work? For instance, use melted butter and cinnamon in place of the olive oil and Parmesan cheese. Once again the possibilities are endless. 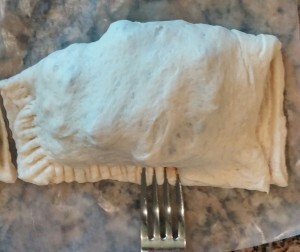 FOOD FUN: Calzone is an Italian word for “stocking” or “trouser”. It has also been referred to as “pants legs” for “walking around”-the fact that they are hand held, easy to carry and eat. They also hold the heat in well. It is that time of year where it seems the pace of life gets quicker and the days get shorter. Plan ahead. 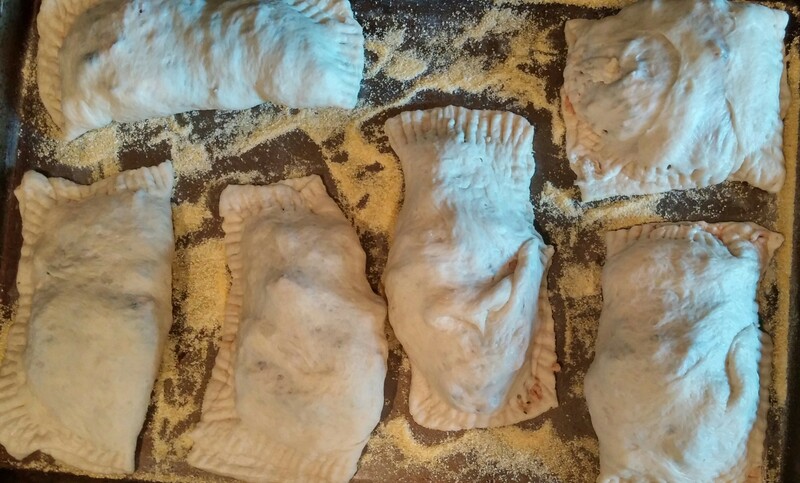 Take a family fun night to make some calzones-(like a pizza night). Make a few different kinds, cook them, let cool, wrap separately, label each one and freeze them in a ziploc bag. When in a pinch or running out the door, grab, heat in microwave (2-3 minutes), wrap in foil and go. Don’t forget the napkins! ANOTHER GREAT BLOG SUSANNE! Fantastic idea for leftovers…..your calzones are so delicious, no matter what you add. Enjoyed Lady and the Tramp, such a classic. Really enjoying your blog, not only the creative use of “makeovers”, but also your restaurant tips (or should I say secrets?) I am on the quest for the perfect spaghetti sauce-think I have the meatballs nailed thanks to Ina-any recipes you would share? Food quests are fun! I don’t have any recipes written down, but here is a little of how I make my sauce. I like a hearty one! Fresh plum tomatoes are best, but here is a trick to using canned peeled whole tomatoes. First, buy the best canned tomatoes, worth the money. Second, put whole tomatoes in a mesh strainer over bowl and let liquid go through. Then using your hands, crush the tomatoes letting more liquid run through. Let sit for a few minutes. After sauteing your vegetables, I use onions and garlic (lots of garlic), some mushrooms (2 or 3 varieties). Deglaze the pan with a dash of red wine, add the tomato juice, some beef broth and let simmer for an hour. I then add my crushed tomatoes and herbs (oregano, fresh basil, bay leaf) drizzle in some balsamic vinegar, bring to quick boil, add some more red wine and let it slowly simmer for a few hours. Hope this gives you some ideas for your own creation!